This has been out for years, but I only came across it a week ago, courtesy of my buddy Mike Dabaie: surf covers of black metal songs. The gimmick works because the covers (allegedly done by blackened tech/prog prodigies Xanthrochroid) clearly show an understanding of both black metal and surf rock. Rather than the typical "let's play this metal song in a way that isn't heavy" shenanigans that seem to be such a hoot with indie kids, there's a real love for both the source material and the assimilated style. I'm not immune to the charms of surf guitar, possibly because all the Dead Kennedys I listened to during my late teens, and possibly because seeing masked surf rock barons Daikaiju in Amsterdam in 2002 was one of the highlights of my trip there. All the covers I've heard (I Am The Surf Wizards, Surfin Moon, Californian Hunger ) are extremely entertaining, but the best has to be a reworking of Immortal's "Tyrants" that surprisingly manages to keep the ominous spirit of the original, and yet wouldn't be out of place on the soundtrack of a coastal detective show like Terriers. 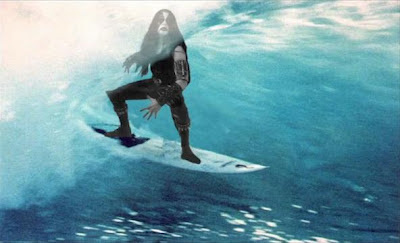 And the photoshopped pics of Abbath and Horgh riding the waves are too awesome for words. Hopefully Xanthochroid don't get so big as to preclude there being more of these in the future.